The record I bring you today is a big favorite of mine – one you’ve heard on the Iron Leg Radio Show podcast – and one that I chased for a while before finally adding it to my crates. 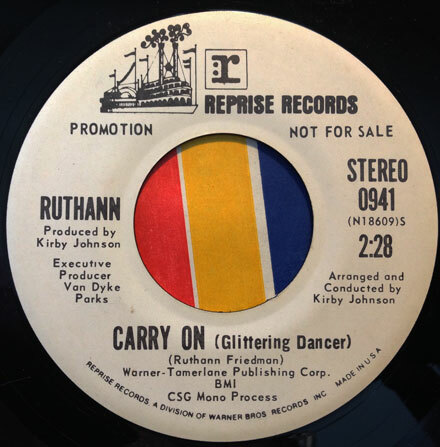 The artist, named here as ‘Ruthann’ but in fact Ruthann Friedman, has one of the more interesting back stories in all of 60s pop. I first encountered her music via a 45 by the Garden Club, a one-off affair that featured Friedman, Tom Shipley (later of Brewer and…), with songwriting by Tandyn Almer (’Along Comes Mary’) and production by Larry Marks. I was already familiar with all of those names, except Friedman’s, so I started digging. The first thing I discovered was that Friedman had written the Association’s huge 1967 hit ‘Windy’, which of course went on to be recorded many, many times in a wide variety of settings. I was surprised I had never heard about Friedman. As it turns out, Ruthann Friedman was a native of the Bronx who had moved west as a teenager, falling in with the west coast folk scene. She was (as indicated by the cast of characters associated with the Garden Club) part of a very talented and interesting crowd. 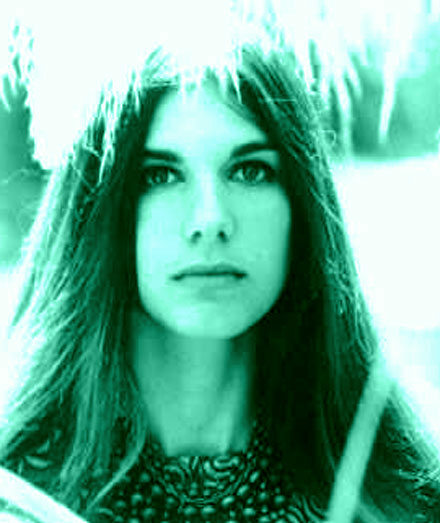 Friedman’s style was a timely amalgam of folk and pop, which she fleshed out on her 1969 Reprise LP ‘Costant Companion’. Not long after I managed to find a copy of that album, I found out that not long after its release, Friedman recorded a 45 with none other than Van Dyke Parks at the controls. You already know I’m way into Parks, so I set off in search of that 45. It would appear that the record in question, ‘Carry On (Glittering Dancer)’ only ever got to the promo stage (issued with mono mix on one side, stereo on the other), and in combination with the already obscure nature of Friedman’s oeuvre, was like the fabled hens teeth. The record doesn’t trade for a lot of money (comparatively, it seems to run for 30 or 40 bucks) but it is maddeningly scarce. When it finally did turn up, I managed to grab it at a steep discount (always a treat) and when you hear it I think you’ll see why I was so happy. ‘Carry On (Glittering Dancer)’ is unlike anything on Friedman’s album (which is mosty folk psych). It is – like many Van Dyke Parks joints – dense, packed with ideas, butting up against the avant garde yet still anchored in a pop foundation. The base coat –as it were – is pretty simple, but as the 45 rolls on it is adorned with horns, strings, percussion and layers upon layer of Friedman harmonizing with herself. The horns are especially interesting, flirting with dissonance (you go, Van Dyke! ), which while probably dooming the record to exile from the radio, made it a crucial part of both Friedman’s and Parks’ stories. 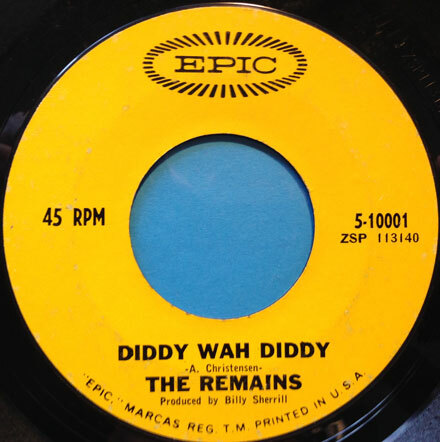 Oddly (and sadly) after this 45 hit the streets in 1970, Ruthann Friedman never recorded again. I have heard about her performing, and there have been reissues of her released and unreleased (demos, etc) material. You can get ‘Carry On (Glittering Dancer)’ as a bonus track to the iTunes release of ‘Constant Companion’. It is a very groovy record and yet another piece in the Van Dyke Parks puzzle. Near the end of February, the sad news came down that the drummer of the mighty Remains, Chip Damiani had passed away at the age of 68. Back in the garage/mod days of the 80s, when reissues of classic 60s material were coming fast and furious, the French import comp of the Remains best material was a big favorite. 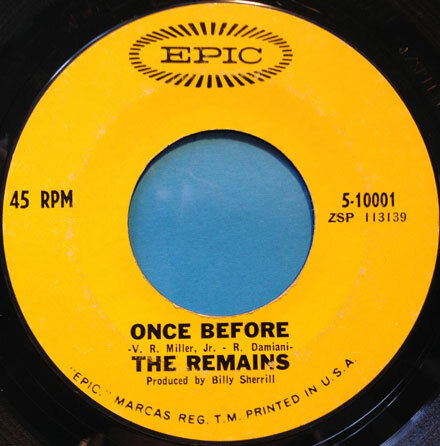 Record collector types are always bending someone’s ear about how their favorite band really should have been huge, but in the case of the Remains, that old saw has the ring of truth. 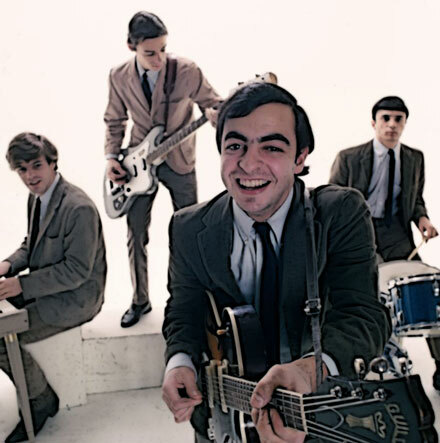 Formed in Boston in 1964, the Remains made music that was hard edged – often muscling in on the garage punk vibe – full of R&B swagger yet with enough pop flavor to get them (theoretically, anyway) on the radio. They were enshrined on 1972’s ‘Nuggets’ comp, with ‘Don’t Look Back’ (written by a young Billy Vera), but that record – as great as it was – only scratched the surface. Despite a lack in actual chart success (outside of Boston), the Remains managed to make it onto the Ed Sullivan show, and score themselves a spot opening for the Beatles on their last tour in 1966. They shoulda/coulda been, but broke up not long after the Beatles tour. In their short career they recorded one rare LP for Epic, a handful of 45s (most of the tracks from the LP), and that – as they say – was that. The two tracks I bring you today were released on 45 in 1966. Their reading of Bo Diddley’s ‘Diddy Wah Diddy’ was their biggest hit – charting in the Northeast and southern California – and has a big, booming sound. The drums, acoustic guitar and electric piano get things rolling before the harp and vocals come in. There’s plenty of forward motion for the dance floor, and just enough grit for the longhairs in the crowd. The flipside, ‘Once Before’ – opening with a razor sharp rhythm guitar slash – sounds like what the Yardbirds might have sounded like had they emerged on the opposite side of the Atlantic. Written by Chip Damiani and bassist Vern Miller, the song is my favorite of the band’s original songs, and in a just world would have been a hit. Fortunately, after decades of doing other things (with Barry Tashian crossing paths with Gram Parsons and Emmylou Harris) the Remains came back together in the late 90s and performed at many modern garage fests. You can grab all of their material in reissue (hard copy and digital), and if you dig these tracks, I assure you that the rest of their catalog will not disappoint. This month I was in the mood for some hooks and jangle, so I dipped into the archives and pulled out a bunch of groovy stuff. You get a grip of Curt Boettcher-associated material (songs, productions, arrangements), some soft pop, sunshine, bubblegum and even a bit of freakbeat. Wait for a sunny day and play this one while you fly a kite (cuz kites are fun!). The tunes I bring you today ought to both be very familiar, of not in the versions you see here. You already known I’m a big fan of Tommy Boyce and Bobby Hart. Despite their Monkees-related fame, both Boyce and Hart were working as successful songwriters prior to their association with the law firm of Dolenz, Jones, Nesmith and Tork. Both of the records featured today are recordings of songs done by the Monkees, but done before the Monkees (get my drift?). 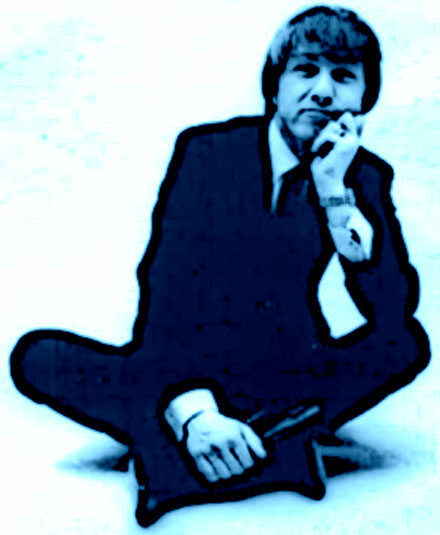 ‘Tomorrow’s Gonna Be Another Day’, written by Boyce and Steve Venet (Venet co-wrote the theme to ‘Where the Action Is’ with Boyce and penned songs with Jeff Barry and Ellie Greenwich, in addition to co-writing ‘The Roach’ for Gene and Wendell), was recorded by a number of groups in the mid-60s, including the Astronauts and the Shadows of Knight. The version you have here was waxed by Sir Raleigh and the Coupons in 1965. Sir Raleigh was a pseudonym for a pre-Buffalo Springfield drummer/vocalist Dewey Martin. 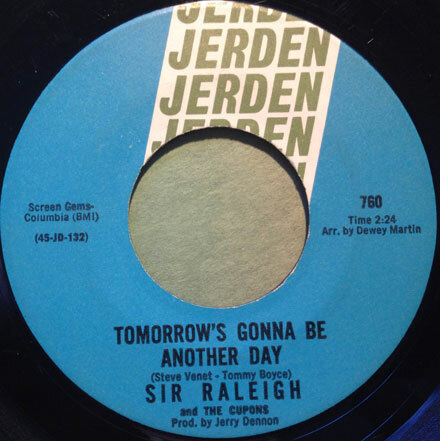 Sir Raleigh and the Coupons (the name a reference to a then-popular brand of cigarettes) recorded one 45 for Jerden (as well as one for Tower and another for A&M), which was also issued in Australia under the name ‘Sir Duncan and the Yo-Yos’. Their version of ‘Tomorrow’s Gonna Be Another Day’ has a hard, garage edge to it (like the Astronauts take) with a great lead vocal by Martin and a wailing guitar solo. 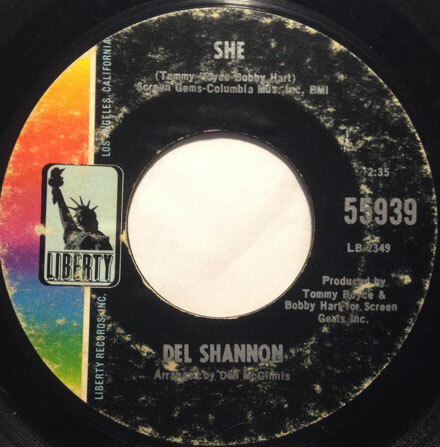 Del Shannon had a run of hits that lasted from 1961 (with ‘Runaway’) to 1965 (with ‘Keep Searchin’’). 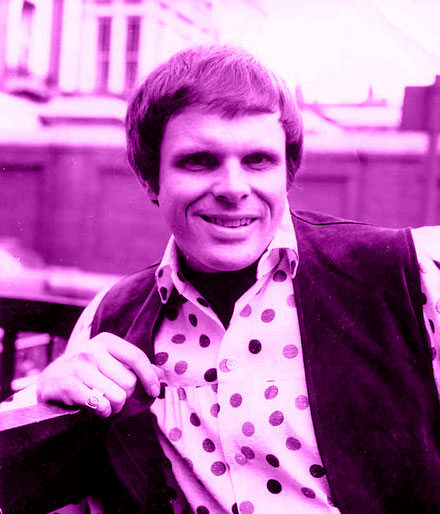 By the time he recorded his version of Boyce and Hart’s ‘She’ in 1966 (pre-dating the Monkees by a few months) he was in the grips of a dry spell that never really let up. Despite the fact that he was a stranger to the charts, Shannon did some of his most interesting work in the mid-to-late 60s. ‘She’ (produced by Boyce and Hart) opens with fuzz guitar and combo organ, with some cool lead guitar punctuating things through the verse. Shannon’s vocals are predictably excellent, and the backing vocals are very cool, too. I can only imagine that had he the kind of momentum the Monkees did, his version might have been the hit. Both versions are very cool, and make me want to see the new Boyce and Hart documentary (a lot). I hope you dig them, and I’ll see you all next week.